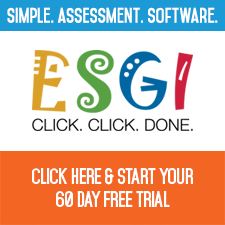 I have spent this week testing, using fabulous ESGI, preparing for my Mid-Term Conferences. Today, I enjoyed a little entertainment from this delightful student. Me: Please write the word in the box, saying the sounds as you write. Pig. Cutie: (As she writes the letters p-i-g). "Oink, oink, oink. That was easy." Cutie: "Well! That's easy too. Cluck, cluck, cluck." (As she easily writes H-e-n). Yep, Kindergarten keeps me fully entertained! And because ESGI makes the assessments a breeze I am able to assess stress-free, allowing me to savor small magical Kindergarten moments. By the way! You still have time to enter The AMAZING ESGI Giveaway! : Follow this link for full instructions.